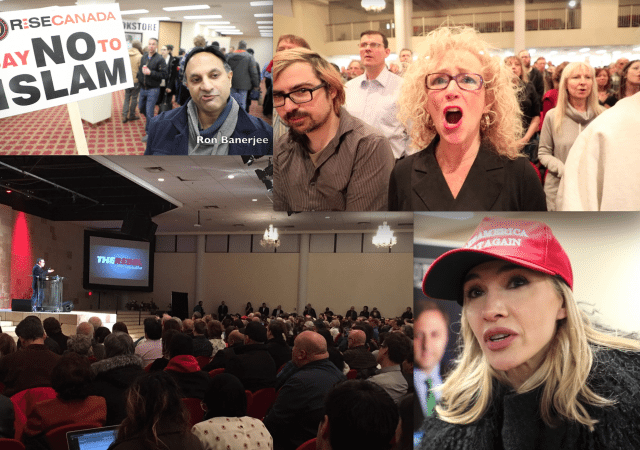 What's It Like To Cover The Rebel Media Freedom Rally? Screenshots from Zach Ruiter’s video coverage of last month’s Rebel rally. For an inside look at what it’s like covering an event like the recent Rebel Media ” rally for free speech” on February 15, have a listen to this great podcast, Brief Remarks, in an episode called Trump North, featuring Torontoist‘s Zach Ruiter and Vice Canada‘s Sarah Hagi, who bravely reported from inside the lion’s den while wearing her hijab. Hosted by Toronto Star columnist Susan Delacourt, the conversation is a fascinating look at the ethical questions journalists face while covering racist movements. Where is the line between documenting hate, and giving a platform to hate speech? ICYMI, watch Ruiter’s video coverage from the rally. Read Sarah Hagi’s coverage in Broadly, I Went to a Pro-Islamophobia Rally Hosted by Canada’s Breitbart in My Hijab. Listen to more Brief Remarks here.